Interested in promoting Health and Wellness in Kings County? 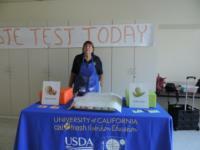 See how the UC CalFresh Nutrition Education Program is making a difference in Kings County. Ready After School Program participated in a 5K MyPlate Run to promote physical activity and healthy eating. Students enjoyed the MyPlate obstacle course and the healthy snacks that incorporated all five food groups. The UC CalFresh Youth Nutrition Education Program provides no-cost curriculum, support and resources to all teachers in low-income Kings County Schools to deliver nutrition and physical activity education in the classrooms! 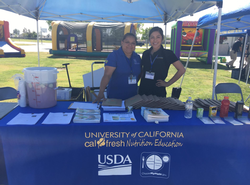 In collaboration with local partners the UC CalFresh Nutrition Education Program provides evidence-based nutrition education to low income individuals and families. Our goal is to help consumers with information on food and nutrition, food safety, and resource management. No-cost classes are available to low-income adults residing in Kings County. Click here to discover the classes we offer. Transportation is an issue for some of our seniors in Kings County. This senior has found a way to get his physical activity in and receive food at the distribution site. The Commission on Aging recognized that the seniors in Kings County were facing food insecurities. 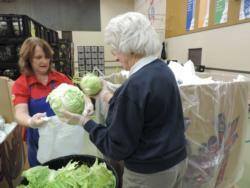 A collaborative partnership between the Commission on Aging, Feeding America Food Bank, Hanford Parks & Recreation and the UC CalFresh Nutrition Education Program to establish a monthly food distribution. The food distribution is held once a month on the 1st Wednesday of every month from 10am to 12pm at the Long Field Center. (560 S Douty Street, Hanford, CA 93230. For More information click here! Working on your school wellness policy or just would like it reviewed? Lincoln Ready program has been instrumental in bringing good nutrition, nutrition education and healthy behavior habits to their students. 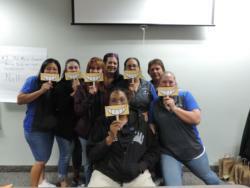 The UC CalFresh Nutrition Education Program is thrilled to be a part of the team who works with Lincoln Elementary Ready Program to provide nutrition education. Kings County has two organizations who have received the SNAP-Ed grant, Kings Community Action Organization and the University of California Cooperative Extension Office. The implementing agencies in Kings County collaborate to provide educational and environmental support in helping SNAP-Ed eligible population consume healthy foods and beverages, decrease consumption of less healthy foods and beverages, and increase physical activity. For more information about the grant and services we provide click here. 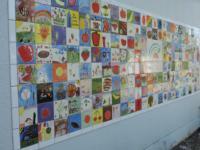 Read about what UCCE is doing! Do you have an event that we could promote Health or Fitness? Contact us to find out what we can do at your event. The UC CalFresh Nutrition Education Program promotes gardens to encourage families to eat healthy and fresh. Click here to see all the ways that a garden can make a difference! Smarter Lunchrooms use simple, low-cost changes to the lunchroom enrivonment to get students to take and eat more healthy foods. The UC CalFresh Nutrition Education Program has two trained Technical Assitance Providers for this program.For more information about the program or how to start this at your school click here! Here is one of the ways that TAP (Techical Assistant Providers can work with your school. Hanford Joint Union High School District Food Service Director asked us to help with a taste testing melons at all four high schools. Students were able to try at least two different melons and vote on which one they would like to see added to the menu. This material was produced by the University of California CalFresh Nutrition Education Program with funding from USDA SNAP, known in California as CalFresh(formerly food stamps). These institutions are equal opportunity providers and employers. CalFresh provides assistance to low-income households and can help buy nutritious foods for better health. For CalFresh information, call 1-877-847-3663. UC Delivers is a collection of examples showing how ANR is making a difference for Californians! Would you like to locate a park or community center in your neighborhood? Visit the Nutrition and Physical Activity Resource Directory to find low or no-cost activities near you.